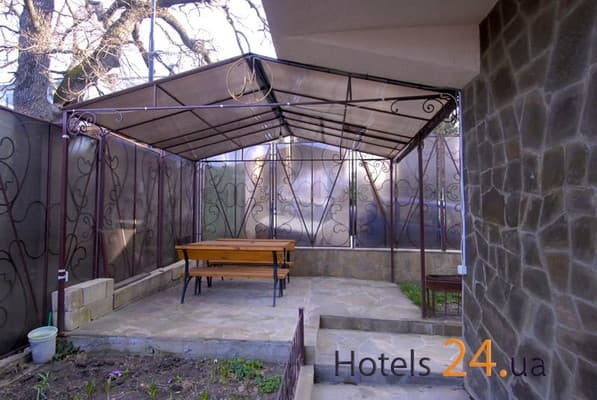 Three-room apartments are located in a private 3-storey house in the village of Livadia (3 km from Yalta). 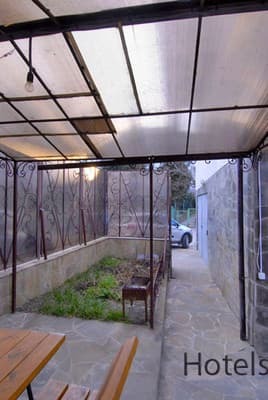 Closed yard, recreation area under the awning, BBQ, sea views, independent heating, uninterrupted water supply. On the 1st floor there is a garage, a guest bathroom, an entrance hall. On the 2 nd floor - a large kitchen-studio complete with furniture and appliances. On the third floor there are two rooms. In one room there is a double bed and TV, in the 2nd room there is a large double bed and a balcony. Bathroom is a large area (bidet, toilet, hydromassage cabin, washing machine). And also on the ground floor of the house there is an even larger room with two folding sofas. The house can accommodate no more than 6 people. Transport interchange near the house, a children's playground 70 meters away, to Yalta 7 minutes drive. To the sea - 15 minutes walk. Distance to the bus station in Yalta - 6.4 km; before Simferopol - 88.2 km. PRICES MAY CHANGE, IT IS REQUIRED TO RECEIVE INFORMATION FROM THE OPERATOR. Description of the room: On the 1st floor there is a garage, a guest bathroom, an entrance hall. On the 2nd floor there is a large kitchen-studio (built-in electric stove, oven, extractor fan, microwave oven, electric kettle, refrigerator, bar, dishes). On the third floor there are two rooms. In one - a double bed and TV, in the 2nd - a large double bed and a balcony. Large bathroom (bidet, toilet, hydromassage cabin, washing machine). On the ground floor of the house there is a large room with two unfolding sofas. The house can accommodate no more than 6 people. 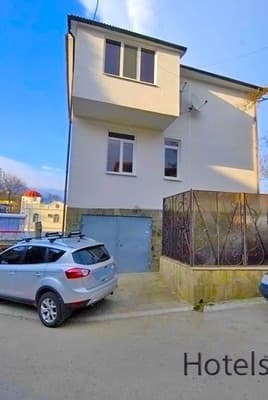 Three-room apartments are located in a private 3-storey house in the village of Livadia, 3 km from Yalta (7 minutes drive). To the sea - 15 minutes walk. Distance to the bus station in Yalta - 6.4 km; to Simferopol - 88.2 km. From the railway station of Simferopol on any transport to Yalta. Near the railway station of the city of Simferopol (exit to McDonald's, in the direction of the tower with a clock) are auto- and trolleybus stations. From there, by regular bus, fixed-route taxi or trolleybus number 52 you can get to Yalta in 1,5-2,5 hours. By car: from Simferopol, go along the M-18 highway to the Angarsk pass, then through Alushta - on the upper intercity route (landmark, so as not to get lost in Alushta - the wires of the intercity trolley bus), then go along the upper, intercity route (M-18) along the whole The Juba is still 41 km to Yalta. From Yalta to the village of Livadia by shuttle bus number 11 or bus number 5. There is a transfer from the Yalta bus station (the service is free).